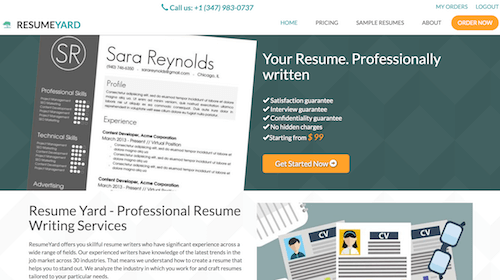 ResumeYard.com provides professionally written resumes. They claim that your satisfaction, confidentiality and an interview are all guarantee. They offer a wide range of products: resumes, CVs, cover letters, LinkedIn profiles, and some others. There’s also different levels of experience and they’ve got writers for every one of those. From entry to executive or even military, you’re covered. Your paper can be delivered in just a day while you also receive unlimited revisions, professional advice, and direct contact with writers. Their website is beautifully done and does not fail at showcasing their strong points. Pricing starts at just $99. A detailed review of the company is coming soon. Have you had a chance to check our top services?